Who is not such a self-builder or lacks the time needed to build a meteor scatter receiving station can of course also use our online CAMRAS webSDR receiver that is specially designed to receive real time meteor scatter with your own tablet, laptop, smartphone or computer. CAMRAS volunteer Pieter-Tjerk de Boer (PA3FWM) designed this beautiful webSDR software already ten years ago. At the Amateur Radioclub of the University of Twente, his own UT webSDR receiver runs for the entire short wave spectrum from 0.1 to 30 MHz. 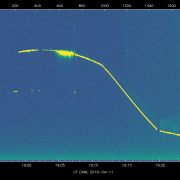 The CAMRAS webSDR for receiving meteor reflections was set up after a successful experiment in 2011 in which we streamed live meteor reflections over the internet for the first time during the maximum of the Perseids meteor shower. As a result, Simon Bijlsma has built the 2-meter and 6-meter Yagi antennae that are now used for the CAMRAS webSDR. The building description can be found in article 1. These antennae are linked to two RTL SDR dongles which then provide the CAMRAS webSDR stream with the help of the SDR software. With the webSDR tuning to the frequency of the French Space radar GRAVES gives the possibility to observe aircraft and the ISS in addition to meteor reflections. Even echoes of the GRAVES radar that are reflected by the Moon are regularly seen! 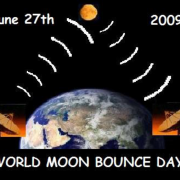 The distance to the Moon back and forth is about 800,000 km and the Moon is also a very bad reflector for radio waves, so most of the signal is lost. 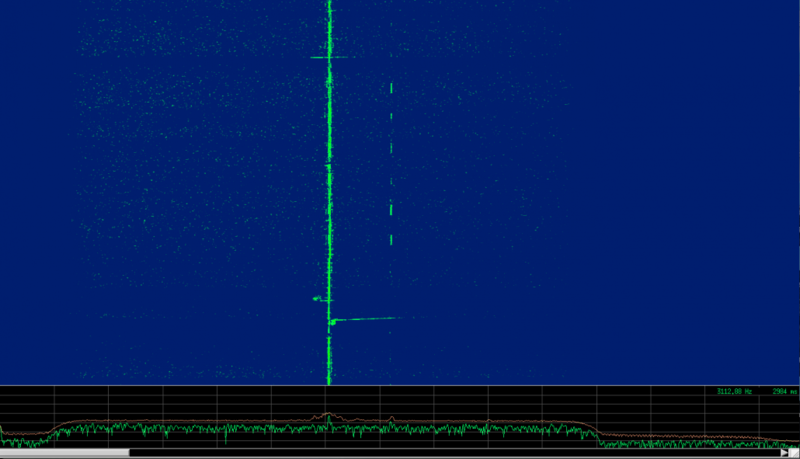 Nevertheless, the echoes are so strong that they can be clearly seen on the webSDR receiver. See above image with meteors (hook-shaped), aircraft (lines in the middle), ISS (slanted dotted line) and the moon (vertical dotted line). 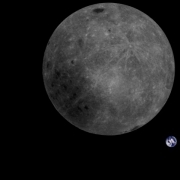 Recently, the webSDR has been expanded with a receiver for a Chinese moon satellite. The Dwingeloo telescope is one of the official reception ground stations for the Chinese moon satellite DSLWP-B. From Germany the uplink command signals are sent to the satellite. 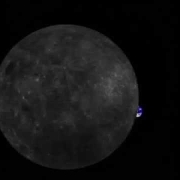 This satellite floats in an elliptical orbit around the moon, through which the satellite can also take pictures of the back of the moon. This is not possible from the earth. However, the nominal transmit power of this satellite is very limited and, depending on the mode used, only 1 to 2 Watt (30 – 33 dBm). The 25m Dwingeloo telescope is used to receive the lunar photos and telemetry signals, the frequencies used in the 70cm band are 435.4 MHz and 436.4 MHz. 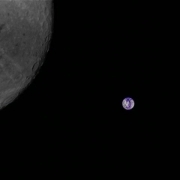 The beautiful photos (see above) of the back of the moon and the earth can be found elsewhere on this website. 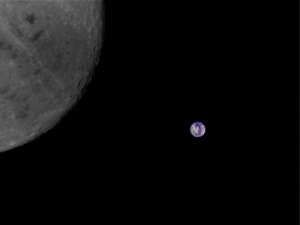 Worldwide there is great interest among radio amateurs for the photos and telemetry signals of this satellite. 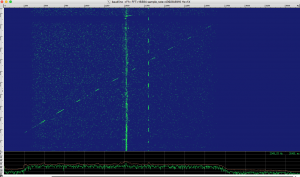 In collaboration with Pieter Tjerk de Boer, Simon Bijlsma therefore connected a third RTL SDR dongle and connected it to the 70cm antenna of the telescope. This allows our many (international) visitors to the webSDR to follow the satellite signals in real time and decode the GMSK and FT4G signals themselves when the telescope follows the satellite.